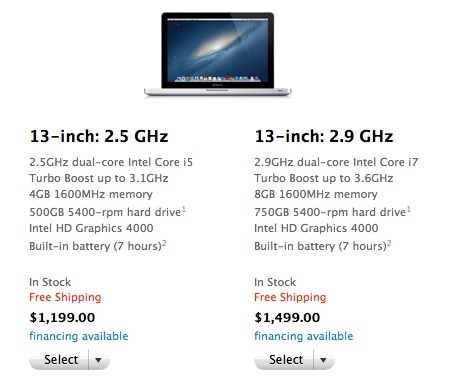 9to5Mac reports that it has begun to receive pricing information on the upcoming 13-inch Retina MacBook Pro. According to the information, the entry-level model should be priced in the neighborhood of $1699, a $500 premium over the corresponding non-Retina model. We’ve now received pricing information on the base model and the “better” model. Based on wholesale prices we’ve received, we believe the entry model 13-inch Retina MacBook Pro will cost roughly $1699 at launch while the higher specc’ed model will cost $300 more making the $2000 price point likely. Interestingly, the estimated $500 price premium for the Retina version of the 13-inch MacBook Pro compares to a $400 premium on the entry-level 15-inch Retina versus non-Retina models. The higher-level 15-inch configuration carries a $600 price premium over its non-Retina counterpart due to the significantly more expensive 512 GB flash storage included with the machine. wow, thats pricey for a 13". Higher premium than the 15", why??? That's a bit more than I expected. It looks the same as the regular one, anybody? And honestly I don't think an Intel 4000 won't be able to handle this, since it can barley handle the 15-inch. Too costly and a boring product. Not even SSD or flash storage. Are you guys really that ignorant? Where in the article does it discuss the specs? You know the pics in the article are of the current models, right? Where did it say no SSD? Not sure where you got that information from.. Damn. If Apple still made them, I wonder how much the 17'' MacBook Pro with "retina" display would cost.